According to my Grandma, every meal should have something spicy and tangy to make the food interesting. Every meal she serves always had a chutney, pickle or a salad as one of the mandatory side dish. This recipe is easy to make and spices up any boring meal . Enjoy ! Coarsely mash the boiled potatoes and add 1/2 cup of warm water and mix it so that it is semi-liquid. Make a paste of the green chillies, timbur and salt and mix into the mashed potatoes. Add turmeric, red chilli powder and lime juice to the potatoes and mix well. In a pan, heat the oil and add the Jimbu / Kasturi Methi. Remove from the heat and pour it over the potatoes and mix well. Adjust the salt, chillies and lemon according to your taste. Serve as a side dish to any Indian/ Nepali meal. 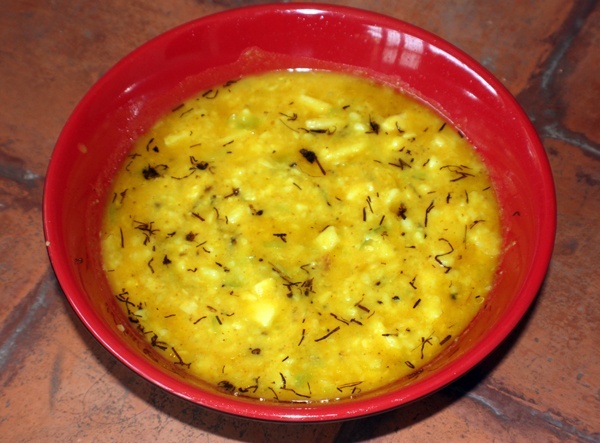 This entry was posted in Grand Ma's Recipes, Nepali Food Recipes, Pickles & Chutneys, Vegetables and tagged Nepali Cuisine, Nepali Recipes by Kamakshi. Bookmark the permalink. My fav aloo dish!! Thanks for posting it! !